I grew up in a new suburb carved out of the woods near the Sandy Hook Bay. We spent most of our waking hours outdoors, not necessarily by choice. As soon as you got home from school, you changed out of your school clothes and went outside. And we stayed out until dinner, ate, then stayed out again until dark. Our division was new enough then that we still had woods. We had our myths--the "strippers" would make you undress if they ever caught you. The murderers would kill you. We were more worried about the strippers. We had tree forts. We learned not to saw off the limb we were sitting on, logical enough, but not so logical that we did not test it empirically. We gained wisdom through concussions our folks never knew about, mutual silence. Every child on Bayberry Lane could find their way through Turtle Woods and Grasshopper Hill. We were the wild things our parents, most of them city children, and many of them immigrants, were not. We knew the moon, we knew the tides. We caught turtles and frogs and snakes and toads. And then one day we cornered a badger. 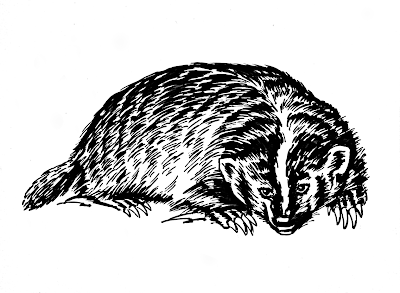 Badgers did not read the ecology journals, and neither did we. I do not know how we figured out it was a badger, but at least two of us had the Zim's Golden Guide to Mammals. What we lacked in cell phones, iPods, and GPS's we had in time. If Zim's said it was a badger, it was a badger. We chased one into its hole, found its alternate route, and started digging. And digging. And digging some more. Dinner time approached. We were busy. We sent a scout to tell Mom and Dad what we were doing. Our parents, being adults, didn't believe us. "There are no badgers in New Jersey." But we knew better. There was, it turns out, at least one. We see what we're trained to see. My CP Biology classes are studying ecology now. Today I had one of my favorite labs. Various critters, some alive, some pickled, are placed on the lab tables. A live cockroach next to a scorpion trapped in acrylic, a live snail next to a pickled pig. Potatoes and young pea plants failed miserably trying to seduce my children from the siren song of strange critters. I ask the kids to describe features of two organisms. 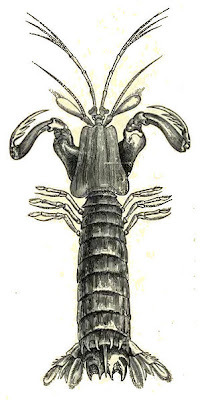 Sharks and horseshoe crabs and sea horses and scorpions compete for their attention. Pretend I'm an alien--I have no idea what an eye is--describe what you see. "Uh, a circle with a black dot in the middle." She walks away puzzled. This was too easy. No questions, and I resist judging. These kids grew up surrounded by a human universe, I grew up in a larger one. I need to be kind. I have a large, live cockroach in class. It's actually the second one I've gotten this year--the first one died from student exuberance and my clumsiness. This one is very much alive. It's long antennae search the borders of its universe under a stereoscope. A couple of girls watch it. The antennae undulate, probing as delicately as snowflakes on a calm winter midnight. Then the cockroach does something unexpected. It cleans its antennae, like a cat licking its paws. The girls are mesmerized. It took hours, but we finally caught it. One fierce, slashing badger, true to Zim's Golden Guide. We marched home, our prized mammal as badgery as a badger can be, and we were promptly told to return it to the woods. Parents can be wrong, and badgers don't read books. Last week my daughter and I continued our futile search for a legal striped bass. Saturday was a gorgeous late November day--we watched the sun settle over the ocean, snuggling far south of where it should be. Just before the sun touched the horizon, when our shadows were longer than our imagination, the few minutes before sunset when a Jersey beach makes Alice look sane, my daughter screamed the triumphant cry of a child with a striper on the line. But her line was slack. A half foot creature writhed on the beach. It looked like a shrimp with an edge. My daughter went to pick it up. I stopped her. And I'm glad I did. On a late November Saturday, a very live and active mantis shrimp, as impossible as a badger in a Jersey suburban woods, tossed itself on the beach,creeping and clambering. And I was again reminded of my badger. My cockroach, our cockroach, sits in a Chinese take-out dish in Room B362. It will be released tomorrow, or maybe Monday if the promised snow arrives tomorrow. My mantis shrimp, our mantis shrimp, may well be dead now--it's too far out of its range, and December has started acting like December, as it will. The sun fades south. I am not sure it will return, and for some of us, it won't. But today, a few children here in Bloomfield became attached to a creature that does not know they even exist. It won't help their test scores. It won't even get them past the midterm. It might even be the only thing they remember three decades from now, long after they've wrestled with whatever homework comes home with their children from biology class. But if they remember the casual cleaning of a cockroach's antennae years after I am dead, I will not have wasted my time here. My sons are not dumb. They are inquisitive, boisterous, constantly thinking, often jumping. They skip as often as they dance. We have a small patch of "wild" in our suburban backyard - trees, rows of vegetables, a picnic table, various pots with herbs and dirt. Lots of dirt. We don't really have a lawn, per se. Just dirt. According to Joel's teacher, he is behind, because he can't identify a picture of a cube or a cylinder or anything 3D. He doesn't watch a lot of tv. The books I read to him don't have a ton of cylinders. But on his report card, he gets an "N" right there. So two days ago, I asked Joel not to throw dirt at Micah. His response was, "I'm sorry." He then waited a minute and said, "This isn't dirt, it's soil and I wasn't throwing it at him I was throwing it in the air. It landed on everyone." He then walked me around the yard and told me about the soil. One part is rocky and is good for picking up chunks and hitting them with a baseball bat. It's called Dirt Clod Cove. One part is the "flat dirt" where it's "as hard as a floor" and then the other part is "fire city" where the dirt "looks like smoke, because it's magic." It's a gamble, but I'm betting he learns more science in the backyard than he would watching "Sid the Science Kid"
Joel won't be tested on soil. He won't be tested for words like "Cove" and "Soil" which admittedly I did not know until I was older. Joel won't be tested on conquering his fear of the dark or taking on monsters in his jungle (bedroom). He won't be tested on sharing with his brother or holding his baby sister or trying new foods that look gross on first sight. This is a wonderful post which reminds me of Dylan Thomas' Fern Hill. 'I lordly had the trees and leaves...' You capture well the fascination that children have with nature. Science teachers like you foster that dynamic relationship. I'm not opposed to standardized testing per se (well, OK, maybe I am), but I am opposed to testing anything if you do not know what your goals are. You're a father, and a good one. Sounds like you're a good teacher, too--I'd love to see a post from you comparing and contrasting what it means to be a good father as opposed to a good teacher--we may find some wisdom in the differences. I have grown ridiculously attached to my cockroach (though not so attached that I have brought him in from the cold). It's amazing how little I know about anything until I spend even a few minutes with it. Another fine poem--keep them coming! And for anybody reading the comments, seeing the three names above just warmed me up on a snowy December evening. Each of them writes an extraordinary blog--just click on their names, and follow the links. You will not be disappointed.